Kids have their own ideas about what makes a great lunch, which can be a challenge for parents who want them to eat healthy. If you're looking for nutritious ideas that children will actually finish, try recipes that are sure to win approval from the short set. From pizza pockets and veggie fried rice to macaroni muffins and avocado wraps, these go way beyond the typical ham and cheese sandwich. Not only will the tasty options please even the pickiest of young eaters, but many are also suitable for kids eating vegan, gluten-free, egg-free, or dairy-free. 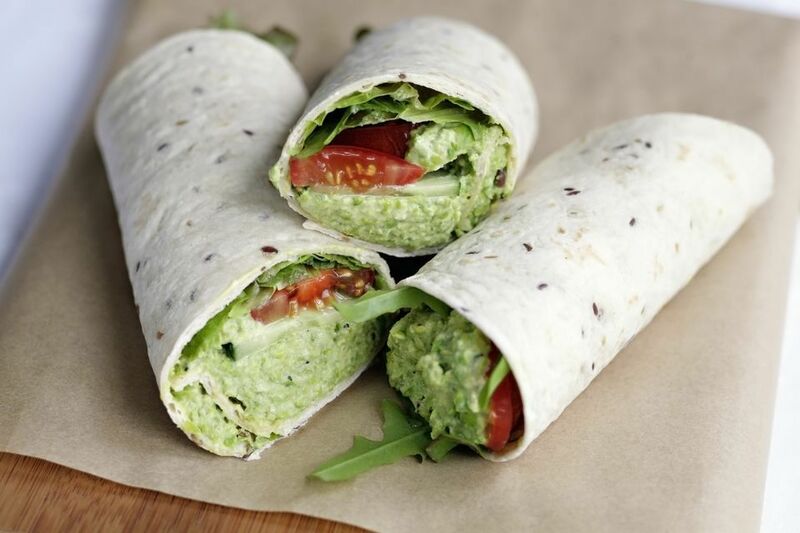 Use ripe avocado—or even leftover guacamole—and protein-rich hummus to make these vegan hummus avocado wraps. Add some sprouts or salad greens for crunch, but leave out the tomato if sending to school to avoid sogginess. A healthy vegan Asian rice salad with plenty of vegetables is a fabulous way to give vegan kids a boost of energy at lunchtime. Brown rice is full of protein and fiber and kids love the crunchy texture and sweet and sour flavors. These cheesy meatball bombs that start with packaged biscuit dough explode with kid-favorite Italian flavors of meatballs, tomato sauce, and Parmesan cheese. Kids love creamy avocado and this easy toast recipe is a hit! The ultimate avocado toast can be served simply as is or layered with slices of crispy bacon to make a great open-faced lunch sandwich. Whip up an easy tomato sauce, crack open a tube of refrigerated biscuit mix, gather some favorite pizza toppings, and you've got everything needed to make these kid-favorite easy pizza pockets. Give kids a comforting, home-style lunch with this recipe for cute easy meatloaf muffins rounds that are from a classic meatloaf mixture baked in muffin tins. A thermos full of chicken noodle soup is the next best thing to a hug from mom. Make this tasty soup on the weekend and freeze in individual portions for heating and packing into a thermos for school lunches any day of the week. Most kids love sweet, fresh strawberries when they come into season. Send yours to school with this healthy strawberry spinach salad. To avoid wilted greens, pack the vinaigrette separately in a small container, so kids can dress and "shake" their salad just before eating. Skip the takeout pizza with this pepperoni pizza sliders recipe, which layers ingredients from a pepperoni pie onto slider buns to create mini-pizza sandwiches kids will love to eat. Do your kids like sushi? Tell them these nutritious cream cheese and smoked salmon pinwheels are "sushi sandwiches" and watch their lunch bag to come home empty. Place a cold bag in with them to keep chilled until it's time to eat. This dairy-free vegetarian pasta salad is both dairy- and meat-free, making it a great lunch for kids with dietary restrictions. It's also creamy and fresh-tasting thanks to whole wheat curly pasta, ripe avocado, cherry tomatoes, green onion, and basil. Cook up a big pot of this warming vegetable beef soup on the weekend for thermos lunches. The recipe is packed with potatoes, green beans, carrots, celery, and onion, but you can add whatever vegetables you have on hand, such as corn or zucchini. Make this nutritious vegetable lasagna on the weekend and freeze it in individual portions for easy weekday meals. 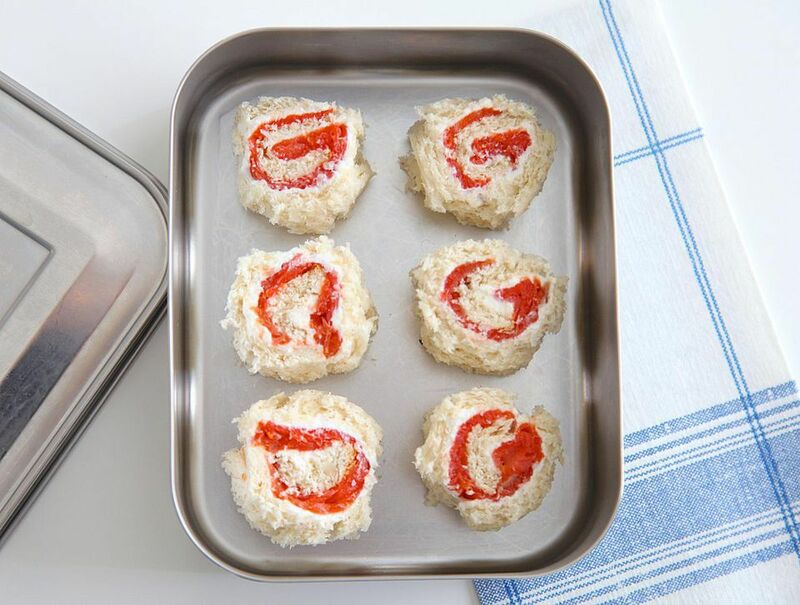 Prep by heating it through in the microwave and wrapping it in aluminum foil for their insulated lunch bag. For those hot days when kids often crave a lighter lunch, this sweetened honeyed fruit salad with honey, lemon, and just a little sugar does the trick. Pack it into a plastic or glass container and add some cheese cubes and crackers to their lunch bags as a delicious snack. This mason jar cobb salad is almost too cool for school. Kids will love shaking it up before they dig in and it's packed with plenty of nutritious ingredients that parents approve of, like cooked chicken, hard boiled egg, cherry tomatoes, and avocado. These easy pizza wraps with just three ingredients are basically cheese quesadillas with spaghetti sauce added inside. Go ahead and stuff them with your little ones' other favorite 'za toppings, such as diced green bell peppers, pepperoni slices, and mushrooms. Wrap in tinfoil to keep warm. The short set will enjoy the sweet, crunchy ingredients in these unusual chicken Waldorf sandwiches served between slices of cinnamon raisin bread. The chicken-and-mayo filling gets extra zip from honey mustard and is mixed with chopped green apples, walnuts, and dried cranberries. Vegan banana muffins are a great way to get healthy fruit into kids. Make them with or without walnuts and feel free to toss some vegan chocolate chips into the batter. This creamy potato and ham soup with cheese is like eating a stuffed baked potato in a bowl. Fill kids' thermoses with the rich and filling soup, which—along with some crackers—makes an excellent school lunch on colder days. Tender chocolate chip banana bread packed with plenty of healthy fruit is a lunchbox snack kids will love. Give them a special treat by packing slices along with an orange or apple to keep their meal balanced. This vegetable fried rice with spinach makes a healthy, meat-free thermos lunch idea for busy kids. You could also add some diced marinated tofu and any other vegetables you usually toss into a stir fry. A Greek salad has plenty of bright, crunchy veggies, plus salty black olives and creamy feta cheese, all dressed simply in a drizzle of olive oil and oregano. Little ones will gobble up these crescent roll pigs in a blanket. Be sure to add extra for sharing and pack them along with little containers of mustard and ketchup for dipping. Deli-style turkey breast and honeyed ham slices are layered onto a whole-wheat tortilla wrap with Dijon mustard and some greens, then rolled up for an easy ham and turkey wrap. Slice it into pinwheels if you like! Kids love this mini cucumber and cream cheese sandwiches recipe, which can be cut into long "finger" shapes (or any other shapes) for their lunchboxes. Fire up your crockpot on the weekend to make this beefy macaroni and cheese for thermos lunches. It's easily made with inexpensive grocery store ingredients, including lean ground beef, prepared cheese sauce, condensed soup, canned tomatoes, and elbow noodles. Three kinds of beans provide this Tex-Mex vegetarian crockpot taco soup with plenty of protein and the seasoning mix gives it the familiar taste of their favorite Mexican food. Skip the cheese and sour cream toppings to keep it vegan. This smooth and creamy perfect tomato soup in a thermos makes a great lunch for kids on cooler school days. It's easily made with canned and fresh tomatoes, canned broth, onion, carrot, and simple seasonings. Float some goldfish crackers on top for a whimsical surprise! Fresh mozzarella—or in kid-speak, "squishy cheese"—is added to juicy sliced tomatoes and fresh basil leaves in this simple olive oil-dressed Caprese salad. Juicy red or green seedless grapes (cut in half for safety) add a burst of sweetness to this simple chicken salad. You can use the recipe to make sandwiches or add some chopped iceberg lettuce to make it a container salad. Gluten-free kids will be the envy of their friends at lunchtime when you send them to school with this rich and creamy gluten-free macaroni and cheese in their thermos. Amaranth flour is the secret to the thickened four-cheese sauce. Vegetarian oven-baked cheese quesadillas with tons of melted cheese and a trio of crunchy, diced bell peppers make a winning school lunch. Bake them quickly in the morning and send them off with little containers of sour cream and salsa for dipping. Waffles for lunch! Sneakily healthy waffles have canned whole kernel corn inside for extra nutrition. Wrap in foil to keep warm and add a small container of maple syrup that kids can pour on top of these corn waffles before digging in. Cold soba noodle salad is flavorful and fun for kids to eat, thanks to its chewy, nutty-tasting buckwheat noodles, carrots, cucumber, bell pepper, radishes, and green onions. It makes a refreshing lunch on warm days. Mac and cheese is a kid-friendly lunch that's even more fun to eat when turned into cute little muffins! You bake the four-cheese mac and cheese muffins in muffin tins prepared with paper liners to create filling pasta bites that students can eat with their hands. If your kids dig chicken nuggets, they'll enjoy these home-baked chicken tenders with a crunchy crouton coating. Pack in an insulated lunch bag for school with some raw veggie sticks or whole fruit. Kids who like omelets will enjoy these Greek mini frittatas that you bake in muffin tins. Eggs, chopped fresh vegetables, and crumbled feta cheese combine with a few simple seasonings to make the tasty, handheld lunch bites. Protein-rich avocado hummus gets extra creaminess and flavor from ripe avocado in this food processor recipe. Whip up a batch and pack with pita bread triangles and raw veggie sticks for dipping. Kids love stuffed potatoes and these twice-baked wonders are loaded with cheddar cheese and bacon for extra lunchtime goodness. You can also make this stuffed baked potatoes with bacon and cheddar cheese recipe ahead and refrigerate for up to three days. This pasta with vegan spinach cashew pesto has plenty of protein and vitamins to keep vegan kids going and packs easily into their school thermos for a warm lunch. This hummus sandwich is so easy to make and a great way to sneak extra protein into vegan and vegetarian eaters at lunchtime. All you need is pita bread, store-bought hummus, and your kids' favorite crunchy vegetables. Kids get plenty of energy from a meaty crock pot hamburger soup you can make on the weekend in the crockpot, with ground beef, frozen and fresh vegetables, onion soup mix, canned tomato sauce, elbow macaroni, a little soy sauce, and Italian seasonings. It doesn't take long to whip up this sweet and sour hot dogs lunch—the sweet and sour hot dogs are sliced and cooked in just 15 minutes. Vegan and vegetarian kids can enjoy the texture and taste of "egg" salad sandwiches with this sneakily healthy vegetarian tofu egg salad. Vegan mayo and sweet pickle relish give the fluffy, protein-packed sandwich a great tangy taste and creamy texture. This salmon croissant sandwiches recipe is a fun idea for your little one's lunch box. You can swap out the lettuce for other greens depending on what your kids prefer. If your kids enjoy broccoli with cheese sauce, they're sure to like this warming broccoli cheddar soup recipe, which blends the two ingredients together into a warming thermos-ready soup. This gluten-free and vegan Italian rice and beans can be made with just a handful of pantry ingredients for a great last-minute lunch idea on colder days. This loaded taco salad with ground beef, refried beans, cheddar cheese, taco seasonings, and chunky tomato salsa features all of kids' favorite Tex-Mex ingredients. Add some tortilla chips for dipping! Use leftover cooked ham and your kids' favorite bread to make these easy ham salad sandwiches. Celery and onion add a nice crunch to the filling, which gets some extra tang from a little yellow or Dijon mustard mixed into the mayonnaise. Mini flatbreads made with store-bought canned crescent dough and pizza sauce are easy for parents to whip up and don't have to be reheated since they taste great at any temperature. Feel free to adjust the toppings for these mini pizza bites to suit your family's tastes.